Welcome to Flip Flops and Snow Boots First Christmas! 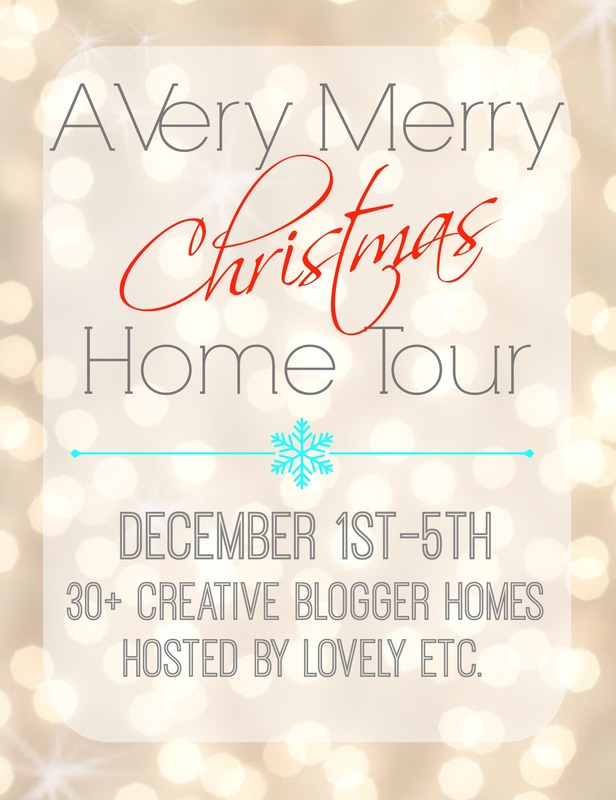 Thank you for taking the time to stop by on the Christmas Blog Hop. I am new to blogging, less than one month into this new hobby and passion. 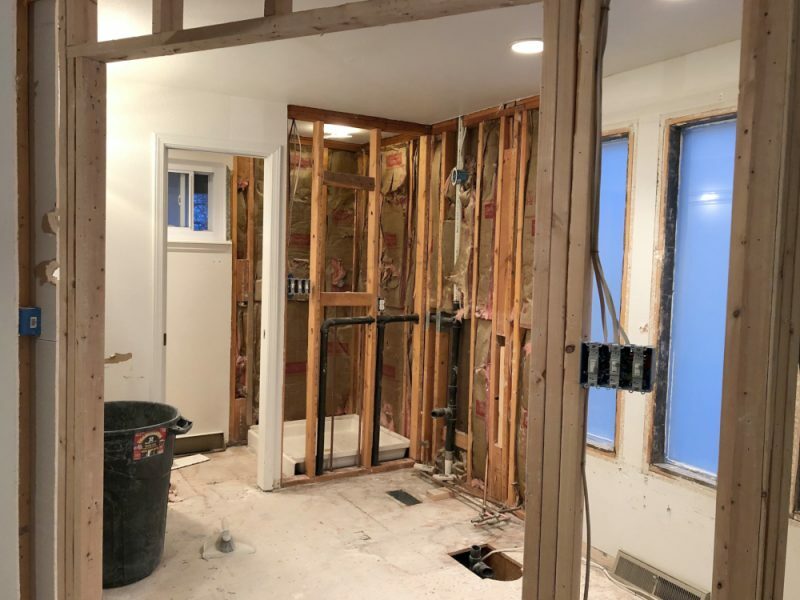 Having a blog is a lot of work, but I am enjoying this journey. I was excited when I got the opportunity to take part in the Christmas Blog Hop with several talented bloggers. I am excited not only to show what I have been working on for countless hours, but also to show off what these other bloggers have been working on for countless hours as well. This has definitely been a challenge to work on multiple projects at a time and get them done and posted before Christmas; not the week of like my procrastinating self would normally do. Grab some hot chocolate (or wine), sit back and enjoy my short Christmas tour titled “Blog’s First Christmas.” Stay tuned as I will be posting all the tutorials for my projects in the following days to come. Please take time to check out the other talented bloggers featured below and the other bloggers featured on previous days, December 1st – 4th. 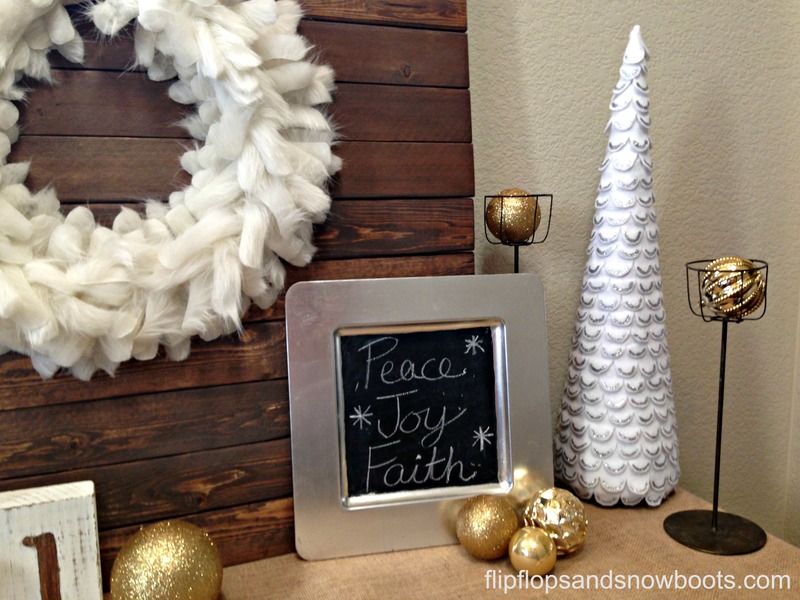 Since this is my first year blogging and first Christmas blogging I kept things simple to start out. My overall colors and theme for my Christmas tour is neutral tones of white, and cream, burlap material, sparkles of silver and gold, and pops of red and green. Our first stop takes us to our front porch. I see tons of these twig stars on the internet. They are usually made in smaller sizes, but I wanted to make a statement with this Giant Christmas Star. I had these long branches in the basement that I got at Ikea years ago. 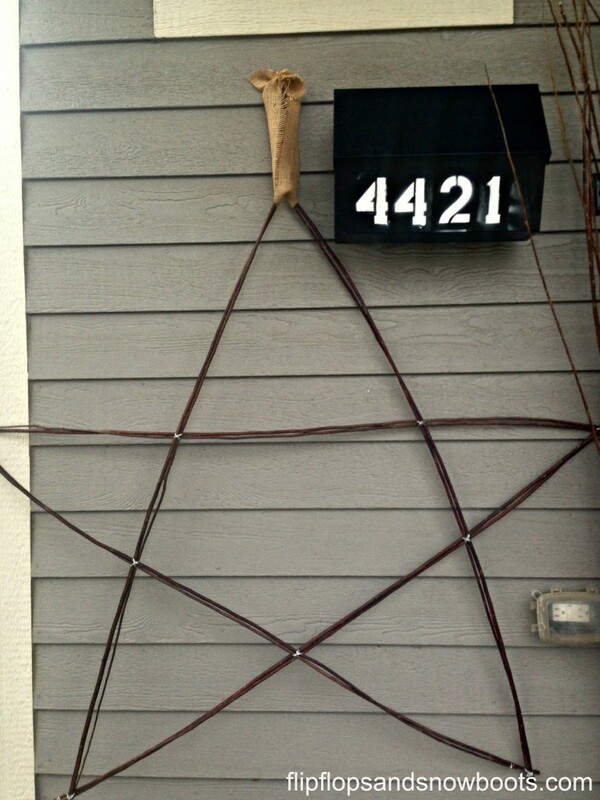 I looped a piece of burlap through the point of the star, tied it and hung it with a nail. As you will see I utilized these branches in a few different areas for my decor. The silver pail holding the branches was purchased from Goodwill for $.99. Using those same branches I used for the star I placed them in the silver vase, wrapped the vase in burlap ribbon and tied it. 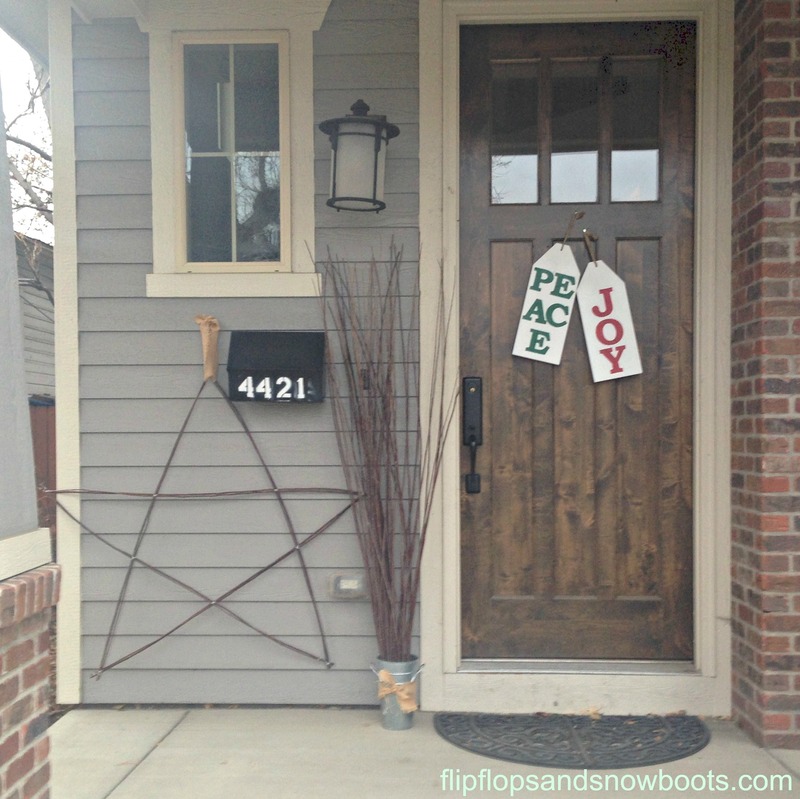 Hanging from the door are my Wood Christmas Tags. 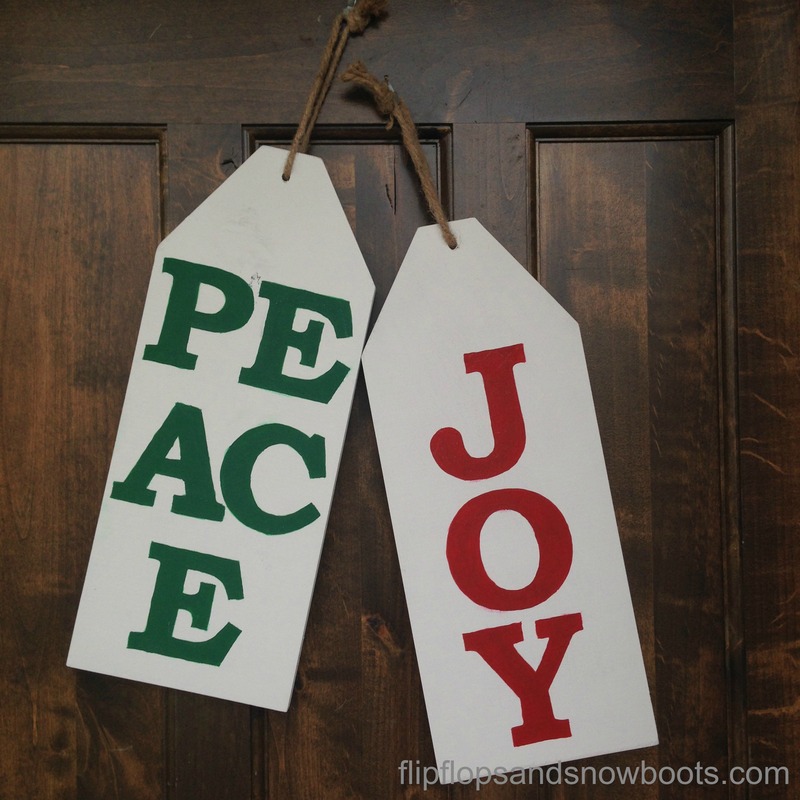 I first saw this on the blog That’s My Letter where she made these Thanksgiving tags. I thought they would be perfect for Christmas. See the tutorial here. Upon entering our house there is a console to the left beyond the front door. This is where the majority of my time was spent these last several weeks and probably where my favorite collection of Christmas crafts are displayed on my tour. I had a lot of fun thinking of ideas of what to put here, shopping, working on the projects and then putting them together for a nice display. I spent my days at Hobby Lobby, Joanns, Michaels, Target, Home Depot and then revisiting them again and again. I will be back again to do some returns (husband is smiling at this comment). Starting from left to right I bought the silver pail from Target for $3 from their $1-$3 section. I then took some scrap burlap material, wrapped it around the pail and tied it in a knot, cut the Ikea branches to size and placed them in the pail. Next is the little ball of fur you see on the stack of cover less books. I think this Christmas Fur Ball I made is so cute. The ball is from the dollar store using left over fur from the fur wreath centerpiece displayed here. The fur ball sits on top of 3 cover less books that I wrapped and tied with burlap ribbon. To the back right is a wreath from the dollar store. 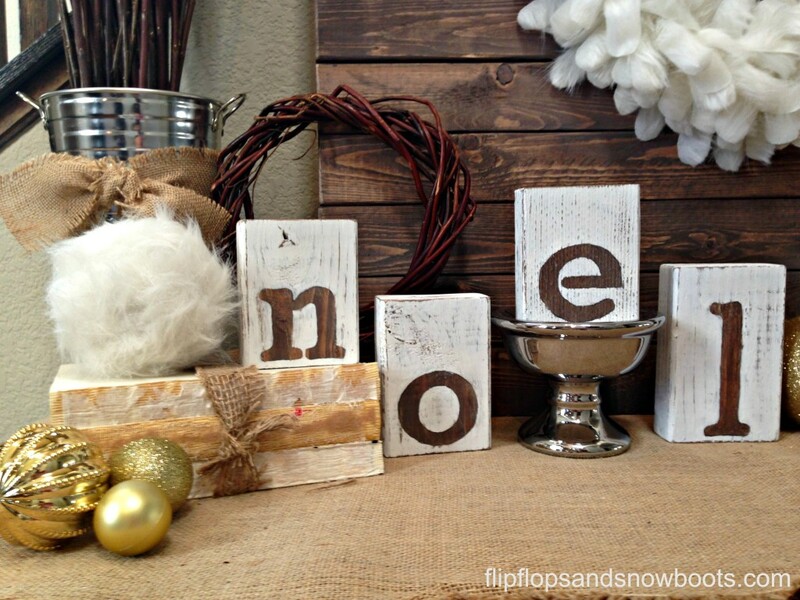 The “noel” was made from left over 2×4 scraps of wood, stain and paint. These were inspired from the blog Chase the Star where she made these “fall” wood blocks.Here is the tutorial for the Noel Wood Blocks. In the middle of the display is a back drop of a bunch of 1x4s nailed, glued together and then stained. 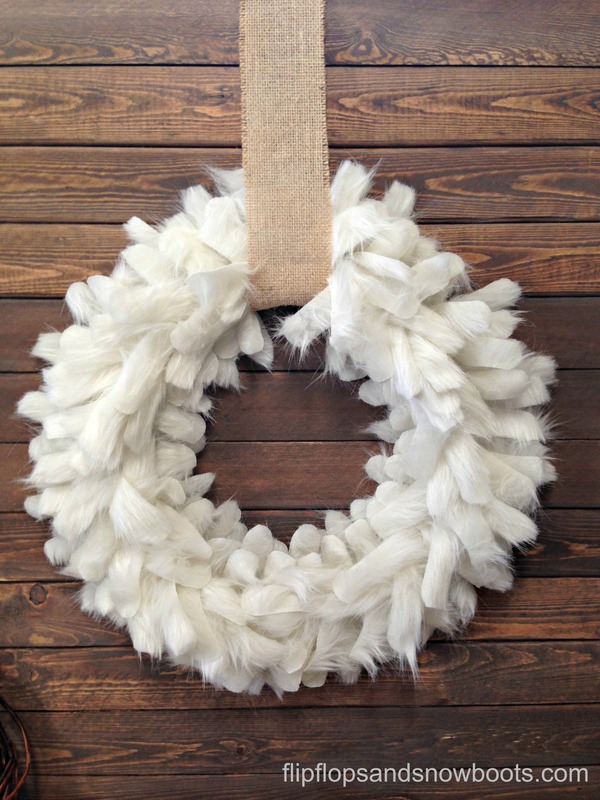 The Fur Christmas Wreath was created from white fur and is being hung with a piece of burlap material that I spray painted with clear glitter spray paint. Next is the silver Chalkboard Charger that I painted with chalkboard paint. Last, but not least is the Felt Christmas Tree knockoff from West Elm. Then I scattered some gold ornaments we had in our Christmas decoration stock to fill in the gaps. The candle stands holding gold ornaments on the right side of the display were found in my basement. I had purchased those from a thrift store. 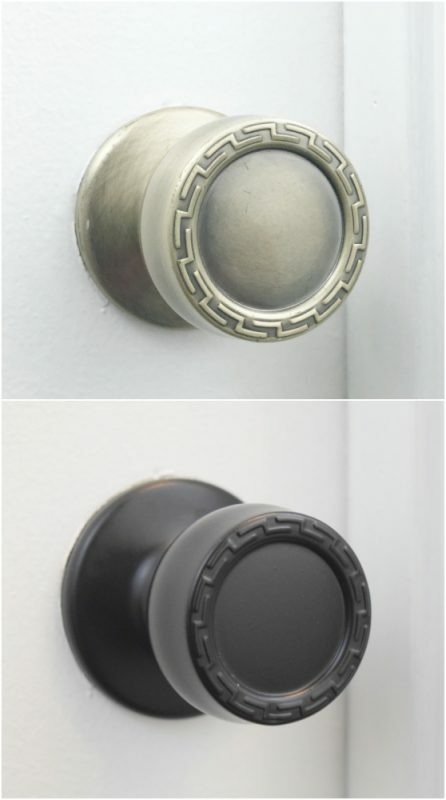 I love when I can utilize something that I already have on hand. It helps to stretch my creativity, save money, and make use of it in my decor. From here we head to the living room where we have the fireplace mantel. Unfortunately we don’t have much of a mantel due to our TV that sits above it. So I have to work with what little space I have. Keeping with the theme colors and textures I chose stockings from Hobby Lobby that were gold, white and burlap. I made the monogrammed stocking holders that hold the stockings out of scrap 2x4s, scrap thin ply wood, old drawer knobs, stain, paint and upholstery nails. Thank you for taking the time to stop by and check out my Blog’s First Christmas. Don’t forget to visit the other blogger’s sites listed below. 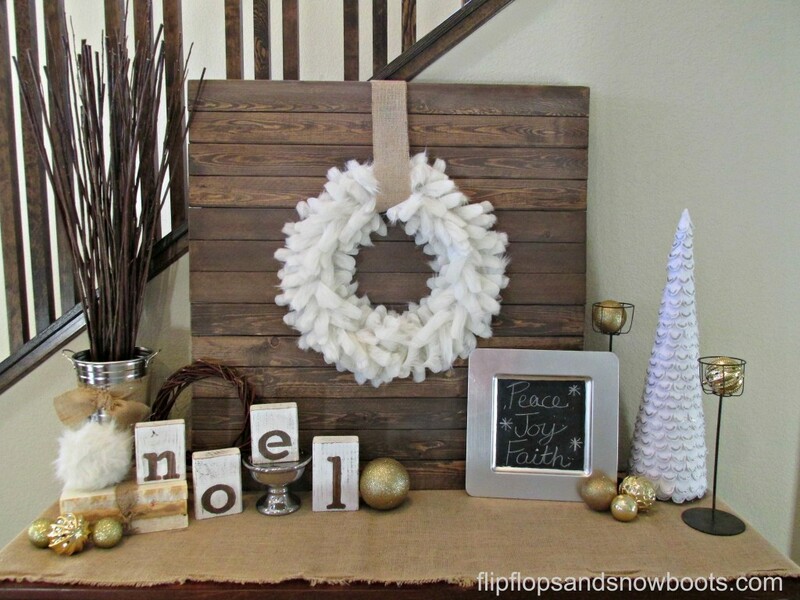 I hope you will find some inspiration to decorate your home for the holidays. 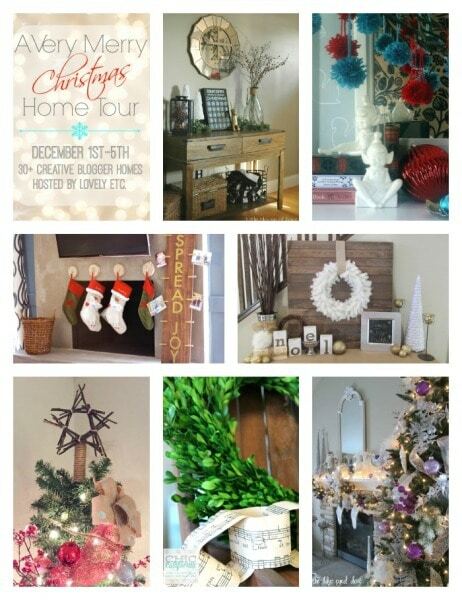 Make sure to check out the other Christmas Home Tours, featured here at A Very Merry Christmas Home Tour. Everything looks very pretty! 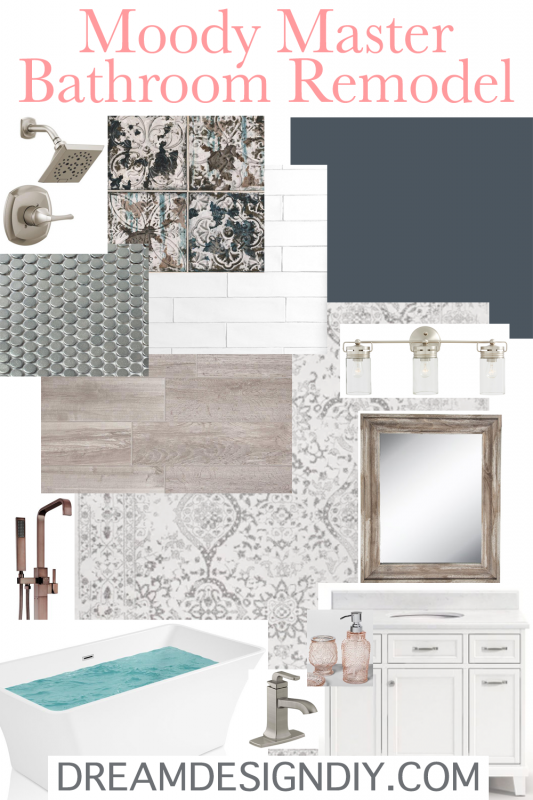 I especially love the vignette in the entry – everything goes together so beautifully! Thank you for stopping by and hosting the blog hop! You have such a beautiful home! 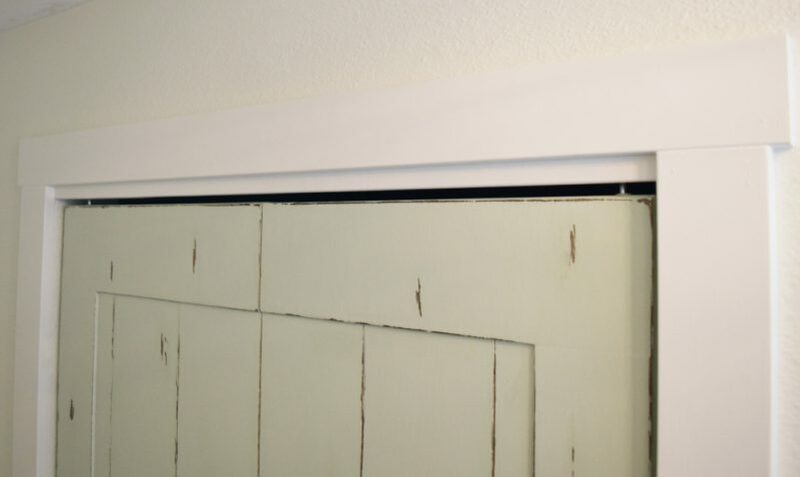 I love all the rustic touches! Those little tags are too cute! And the twig star is the perfect size! Thank so much for stopping by William!